Tableau can connect to many different data sources. Take a look here for an example of connecting to Google Analytics, a web service that provides access to website traffic data. This source (like other server data sources) has its own set of security requirements. Generally, however, you’ll need to know the connection information for the server you’d like to use as well any required login credentials. Google Analytics is a type of data source that will only require your assigned username and password. 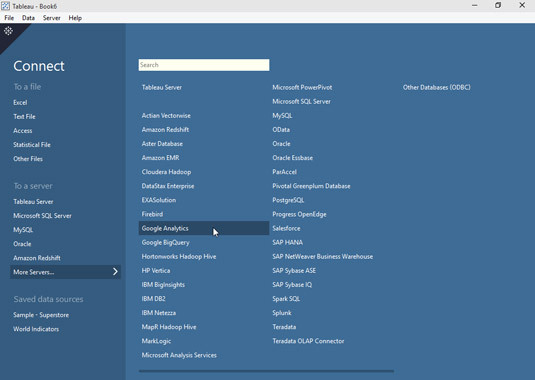 On the Tableau Start page, click the data source type that you want in the Connect panel on the left. You may need to click More Servers to locate the proper server. Locate and click your server. In the dialog box that appears, enter your credentials and then sign in by clicking the appropriate button. For Google Analytics, you sign in by entering your Google account name and password, and clicking the Sign In button. If necessary, perform any extra authentication steps that may be required. For Google Analytics, you click the Accept button to enable Tableau to access your Google Analytics account. Add the dimensions and measures that you want to use in your analysis. Depending on the type of server that you’re connecting to, you may have different steps that you need to complete to finalize your connection. Select the dimensions and measures that you want to use. 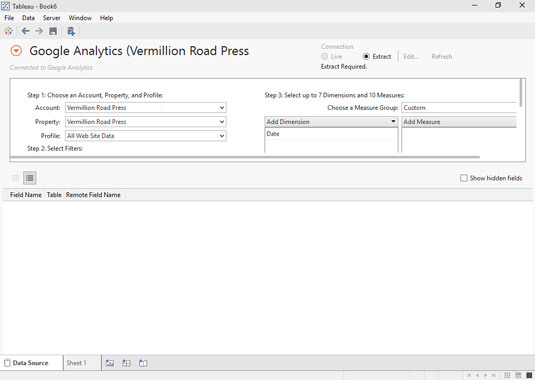 After you’ve established the data connection, you can explore your data in Tableau Desktop. In most cases, functionality is the same regardless of data source.